Continuing our look at ads from the 50s and 60s. 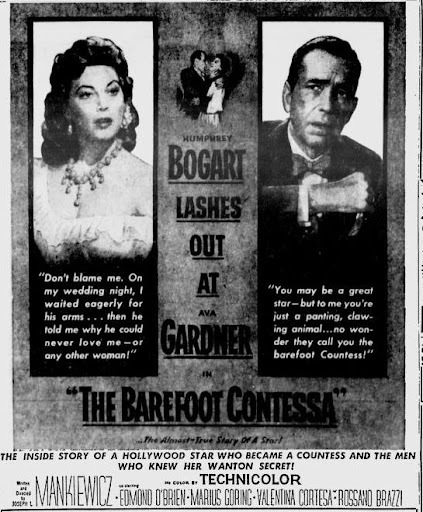 This is The Barefoot Contessa starring Humphrey Bogart and Ava Gardner. My wife is a huge fan of Food Network star, Ina Garten, whose restaurant and TV show are named after this movie. Independently wealthy Kirk Edwards hires washed up director Harry Dawes to write/direct a new film. In a Madrid nightclub they find the beautiful but troubled Maria Vargas as their leading lady. And Maria begins to romance her way through several rich men. Here's the classic trailer for Barefoot Contessa.